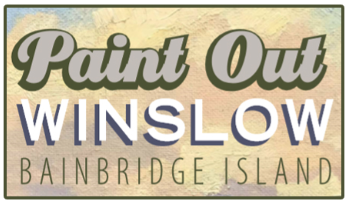 Saturday, September 8th, was the 5th Annual Paint Out Winslow event - a celebration of plein air painting on Bainbridge Island. It was hosted by Martha Jordan of the Winslow Art Center and I had a great time participating. We spent the morning and early afternoon painting and gathered that evening for an award ceremony judged by Michele Usibelli - congratulations to Paula Ensign on her first place prize! Guest artists Terry Muria, Mitchell Albala, Steven Reddy, and Darrell Anderson also participated and it was a treat to see their work in person. Wine tasting with local island wineries and sales of the finished pieces rounded out the event. I’m looking forward to next year - it’s going to be 3 days of painting! I painted two gouache paintings on paper based on two of my favorite spots on the island: Battle Point Park and Weaver Road. Photo by Nick Felkey Photography with a full recap here.